Note: Steve’s Cheese has moved, expanded and now serves sandwiches and small plates. The name has changed to Cheese Bar. He also opened “Chizu”, a cheese tasting bar in SW Portland. A couple of weeks ago, Steve Jones celebrated the one year anniversary of Steve’s Cheese, his cheese and cured meats shop located in Northwest Portland. The anniversary was a milestone of sorts for this city, which up until a few years ago had only a couple of sources for good cheese – Pastaworks and Elephant’s Deli. Over the past year, Steve’s Cheese has rapidly developed into a preferred destination for local cheese lovers. I spoke with Steve recently about his shop, his philosophy and – well, about cheese. Tell me a little bit about your background – how did you originally get into cheese? I cooked professionally for awhile. I didn’t care for the hours, basically – but I knew I wanted to stay in food, so my wife suggested that I try retail food. I ended up managing a deli and I fell in love with buying cheese and cured meats. That was ten years ago. After that, I was contacted by a guy who wanted to build a cheese counter that was based around American artisan cheeses…this was way before anyone else was really doing it. So I got to build the main store (this was the Wine Merchant in St. Louis, Missouri). That’s where I became focused on American products. At that point my wife and I decided we wanted to move back to Oregon, and I ended up doing a couple of years at Provvista here in Portland, learning the distribution end of the cheese business. I left Provvista with the idea of opening a shop in mind, wanting to do it within a year or so, but one thing led to another and I ended up working at New Seasons for 2+ years. While I was there, I built a brokering business. I was brokering for Rogue, Oregon Gourmet, Juniper Grove and Willamette Valley Creamery. Brokering is a little different than distributing – you’re working with placement, making deals. Interesting, but not very profitable. I left New Seasons with the idea of definitely opening a shop. I was working in the front of the house at Park Kitchen at the time just to generate money and have time to get the place open. The original location I was looking at was located next to Park Kitchen, but the lease negotiations fell through. So then I said – hey, why not look at this totally differently. How did the space at Square Deal Wines come about? I had read about Square Deal wines, and so I went up there and started buying wine. I noticed that they had a really big space, and I was also thinking – well, this is a great neighborhood that had everything we were looking for, well educated, well traveled, affluent people in a pedestrian area. It was amazing how quickly it came together. It was a real leap of faith from both ends. 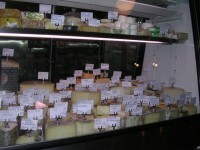 Can you talk a little bit about your approach to selling cheese, the philosophy behind it? Whenever anyone asks what we’re about the single word answer is “small.” We’re small in every possible way. We try to deal with the smallest farmers we can, the smallest producers we can, the smallest businesses. And we’re about 80% effective….there’s some semi-corporate stuff we have to deal with, for example, there’s not a lot of artisan brie out there from France. But we spend all of our vacations visiting cheese producers. Usually cheesemaking regions are beautiful…we just went to Piemonte in Italy a few weeks ago. We were immersed in Robiolas; we were in a hilltop village and one producer was at the bottom of the hill, and as you looked off into the distance you could see something like 8 different Robiola producers within a 5K area, it was very fun. Another thing that is really important to me is education…not being elitist at all. I don’t want people to be intimidated by cheese. It’s frustrating that people put cheese on a pedestal because it’s such a peasant food. A certain percentage of people come up to the case here to look and get really anxious. When I see that I try to give them a taste of a middle of the road cheese – here, I say, try this. But that helps me tell where they are at. What appeals to you about small producers? I grew up in a small farming community in Iowa, and I watched my grandfather’s farm be taken over by a corporate farm. Even as a little kid I knew that was terribly wrong. And I’ve always said that I will do my best to keep small business alive. I think it’s what the US is based on, we’re about freedom and small business and individuality and that’s what I want to support. So it’s political first and foremost. But fundamentally, I think you get better, more interesting products from small businesses. You get the variance and the seasonality. And a lot of it is just greed – I like knowing these people, I like our conversations, I like their quirkiness. In European Union, food traditions are going in a very negative direction, long term. 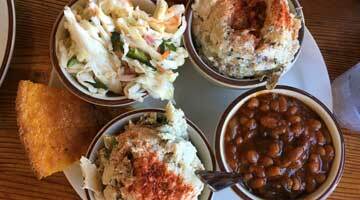 I would like to see the US keep some of those food traditions going in our own vein. I know people over there are going to fight it – and hopefully they will win, because I like European cheese too, I’m not just American at all. In many ways, we’re becoming a world market, and with Lufthansa flying directly into Portland now, that’s opened a whole new window for Portland. Now at least we have a direct connection to Europe…and you can see it from the great fresh cheeses that have started to come in, many are coming from very small European producers. In the last couple of years there’s been a cheese shop renaissance in Portland – suddenly there’s you, Foster & Dobbs, Curds & Whey – why do you think this has happened? I think it was long overdue in Portland. Pastaworks, for example, has been around a long time and Liz Wehrli and Peter de Garmo have done a great job for a number of years, but Portland has been ready for a cheese dedicated shop for a long, long time. I’m not surprised at all to see that we all popped up as close to one another as we did. People sometimes ask if it worries me, and I say no for several reasons…one being that we’re in different parts of Portland, which works out great for all of us. And consumers are so well educated about cheese these days – a well educated consumer is your best consumer. I love it that people are starting to come in and ask for things that I used to have to tell them about. Our time spent educating is becoming less and less and our time spent serving is more. I like the education process, but it can be hard to both educate someone and sell them something. But I think it’s great that we’re all here and Portland could probably handle a couple of more shops, even. I’d like to work on direct importing. I really want to continue developing relationships with cheesemakers. Also, though it’s a huge undertaking on a number of levels, I’d love to do more with affineurship. I did an internship with Neal’s Yard awhile back, and it’s really helped me with how I handle cheese. I probably get 25% more life out of my cheese because of that experience. But in order to really focus on affineurship, I’d love to do another internship…affineurship is something I don’t want to go into half-cocked. I think a lot of people call themselves agers, but if you’re not doing it right, you’re just holding cheese in a refrigerated case. There’s a lot of things I wouldn’t mind doing, but one thing I definitely don’t want to do is make cheese. I go out and make cheese with producers a couple of times a year and I love doing that, but ultimately it’s back breaking work, very hot and humid over very long days with tons of cleaning, and that’s just not my gig. Yeah, a cheesemaker once said to me that cheesemaking feels like it’s about 90% cleaning up. It really is, it’s amazing. That and looking at lists of numbers….you’re looking for that intrinsic moment when the curd is breaking. But beyond that, quite a bit of cheesemaking is looking at ph and such. I think of it as comparing cooking with baking. Cooking is much more artistic and baking is much more scientific; both have aspects of the other, but you kind of have to have that scientific mind to be a baker and you don’t have to in order to be a cook. That’s why I don’t bake. But I have the utmost respect for people who do make cheese day in and day out. It blows my mind that they can do it seven days a week for years on end. Ultimately I just really like being a retailer. It’s really fun to get to know customer’s tastes and so on. There was a woman who was in here earlier today….I’m starting to just get her tastes figured out and it’s fun. The biggest part of selling cheese is really just communicating, listening to a few key words, figuring out the right adjectives to say back to people. I’m really happy about everything that’s happening, but I also think there will be critical mass and some cheesemakers will fold in the process. There are always certain people that are a lot better cheesemakers than others. And I also think that the Pacific Northwest will be a major contender nationally…we have green grass year round and hardly anyone can claim that. California can’t. Wisconsin can’t. Vermont can’t. It used to be that I knew all the local cheesemakers by their first names… now it’s hard to keep up! Kelli Estrella from Estrella Family Creamery in Montesano, Washington is, in my mind, the most gifted new cheesemaker in America. I once asked her – Kelli, how do you make such beautiful cheese? And she laughed and said – I’ve got a problem, and pointed to her head!! I would like to see people coming into cheesemaking with a little more preparation. I see a lot of problems in the cheeses from the newer producers. I see a lot of overdeveloped rinds, rinds pulling away, just technical flaws that, with a little bit of education, people could do well. Most of the producers do eventually overcome these things, but it’s frustrating that people aren’t entering the market at a higher level. Besides selling cheese and cured meats, you offer classes at your shop as well. Do you do events or catering, things like that? We sell cheese cut to order, but I don’t do catering. We don’t sell sliced cheese for a couple of reasons: one reason is that we just don’t have the space, but the main reason is that we don’t believe in cutting cheese before it needs to be cut. But we love to help people set up parties, and we do sell the cut meats. Ultimately we just don’t have room to pull off a full fledged catering business. But we’re always tasting Square Deal’s wines and they’re tasting our cheeses all day, and as a result we’re really good with putting together wine and cheese pairings. We also do farmhouse dinner events, which are large picnics with cheeses and pretty much everything out of the case – a whole bunch of cheese and cured meats and pates, pickles and olives and nuts. Those are really fun, and a festive way to get familiar with all of the products that we sell. But I really prefer that people come in and do the class. You get to taste a lot of product, but you also walk away better informed. Our classes are a great deal, all of them are $15 and you get 5-6 wines and 5-6 cheeses. You can’t buy a flight of wine for that in most places. But we don’t look at it as a money making endeavor, it’s good advertising. 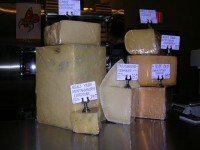 How about some cheese basics…what’s your position on plastic wrap for cheese? 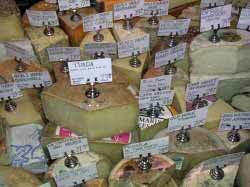 What is the best way to store cheese once someone brings it home from your shop? 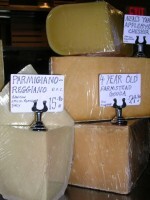 Plastic wrap is a necessary evil for a retailer, because customers have to be able to see the cheese. The eye eats first. We do use cheese domes quite often, and if the cheese has enough moisture we’ll let it sit out. But you have to use something that holds the moisture while still allowing people to see the product. As soon as we cut the cheese for the customer, we take a face cut. We never give you the taste beside the plastic because it tastes like plastic. That’s something people should always be aware of; if they’re having someone unwrap a piece of cheese and give them a taste you might want to ask for the second cut instead of the one right by the plastic. Once we cut cheese for a customer, we wrap it in cheese paper. My unofficial motto is: buy less and come back more. I truly believe that’s the way to go. But if you can’t eat your cheese within 3 days we recommend wrapping it in fresh paper, it can be wax paper or whatever else is handy, and then putting it into a Tupperware container. Then, not only will it have the breathability of the waxed paper, but the Tupperware container is going to keep the moisture in. That’s how I store my cheese at home. People sometimes say things like – I really don’t like that Cowgirl Creamery cheese, it’s just terrible tasting – and inevitably it’s because it’s been wrapped in plastic too long almost every time. It’s expensive, and it can go south so quickly. They make such great cheeses, but so few people get to taste them in great shape. Can you give us some cheese recommendations? People always ask me – what’s your favorite cheese? It’s a hard question to answer because today it might be Montgomery Cheddar, but tomorrow it’s going to be a stinky washed rind cheese from Corsica. Today I’ll say this: first and foremost, try anything you can from Estrella Family Creamery. Also, I love the fresh cheeses of northern Italy – I’m a huge Robiola and Brescianella fan. I’m fascinated by the cheeses from Piemonte and Lombardia. The thistle rennet cheeses from Spain are also really interesting, the Torta del Cassero or Torta de Casar. People should start paying attention to affineurs, that’s a really interesting way to shop. Pascal Beillevaire is doing some really interesting stuff; Jean d’Alos is my personal favorite of the affineurs. These are the people who are really working the magic with cheese. And this time of year, I’m always hot on Neal’s Yard Dairy cheeses – in the winter, they’re just so good, so appropriate for this cold wet weather. I’m also really into cured meat right now, my focus lately has been on small artisan cured meats, I’m just enamored with them. I’m glad to hear steve’s business is going well. Unfortunately, their customer service was so bad when my wife and I visited the shop earlier this year, we don’t plan to go back. We stopped in to the store one saturday afternoon. There were two guys behind the counter, talking to two lovely young ladies about cheese. (Not sure if they were buying or not.) We waited and waited for someone to sell us some cheese but ended up walking out. There are too many other places in town to buy cheese to tolerate bad customer service. I couldn’t disagree with you more about the service. Every time I go there the service has been excellent. No matter what I am buying cheese for, be it a party or just a little something, Steve and his gang always pick the perfect cheeses for the occassion. He never ‘over’ sells me, often telling me that “you don’t want to confuse people’s palates”. Please give this shop another chance. I have to say that the personal service and reccommendations that I get is the reason I keep going back again and again. I have to say I’ve had nothing but great service at Steve’s Cheese. I usually give them a vague idea of what I’m feeling like and leave the final decisions to them. I’ve never been disappointed. In fairness they have made cute girls wait while attending to homely me. I had no idea this place existed. I’ll get there soon. I love a good cheese that is correctly ripe. As for the comments about cheese regulations and the EU: spot on. It’s fairly interesting to watch it. On one hand the EU is pushing regulations that are making it very difficult for small cheese makers to continue to do business, but on the other hand there seems to be a very renewed interest on the consumer end for hand-crafted traditional cheeses (especially in Spain), so we’ll see where this one goes. Perhaps there will be cheese riots! France seems to be having a major identity crises right now overall (you should see how worked up people are over any EU involvement, especially anything food related), so stay tuned. Viva le fromage! Viva la révolution! I can’t wait to check out Steve’s shop, and Square Deal as well. Tami or Steve: is there any more information about the classes, such as when they occur, what they focus on, etc. A $15 class with about cheese and wine definitely sounds like something I’d want to do! PestoGal: Keep an eye on the Square Deal Wine press releases. They frequently have notices about other things going on in the store. The most recent one is here, and a Steve’s Cheese one here. PestoGal: We do classes at least 4 times per month but with the retail “silly season” upon us now our docket will be light until after the 1st of the year. I would invite you to stop by or drop us a line and we’ll get you added to the notification list. Some classes are particularly wine focused but others really split time between wine AND cheese. Steve and I enjoy bantering with customers all the time, but especially in a “classroom” setting. We try to be informative, yet hope to stay casual. If you want to be a geek, that’s fine. If you want to have fun and pick up a tidbit or two along the way, even better.